Flow Factor offers Flow Site Windows by Penberthy. Flow Sites indicate flow via a glass window and can be offered with a flapper, rotator, drip tube or gaseous. In high traffic or confined areas, add protection to your pipeline system. Dual-Window Sight Flow Indicators provide two glass discs on each side, so that if either glass should fail for any reason, the other window can temporarily withstand pressures until the unit can be repaired or replaced. 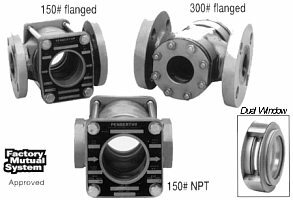 Dual-Window Sight Flow Indicators and Factory Mutual System Approved Dual-Window Sight Flow Indicators are available in 150# NPT Models and 150# and 300# Flanged Models. FM-Approved 150# units are rated for 150 psig. FM-Approved 300# units are rated for 300 psig. Dual windows are comprised of two glass discs held in position by a metallic housing, internal shims and gaskets (pictured above). Consult Factory for other materials/components. or go to our Penberthy Parts form HERE. All the below gages are in stock and can ship TODAY! Please call Jerry at 866-360-9830 to get a great price on a US Gauge. or email with our contact page here. U.S. Gauge Low Lead Series P-500 gauges adhere to the “Reduction of Lead in Drinking Water Act” enacted by the U.S. Congress January 2011. U.S. Gauge Low Lead Series P-500 utility gauges provide economical, reliable service in a wide variety of applications including potable water pumps, compressors, and other equipment. 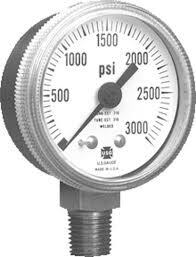 Series P-500 utility gauges come in standard psi ranges with accuracy of ±3-2-3%. Gauges are available in 1-1/2”, and 2” steel cases in center-back and lower mount configurations. Other sizes, ranges, and mounting configurationsare available for OEM quantities. U.S. Gauge Series P-500 utility gauges provide economical, reliable service in a wide variety of applications including pumps, compressors, and other equipment. Series P-500 utility gauges come in English and metric ranges with accuracy of either ±3-2-3% or ±1.6% full scale. Gauges are available in 1-1/2”, 2”, 2-1/2”, 3-1/2”, and 4-1/2” steel cases with a choice of English or metric connections in center-back and lower mount configurations. U.S. Gauge P-570K utility gauges provide economical, reliable service in a wide range of applications including pumps, compressors, and other equipment. Series P-570K utility gauges come in ranges of: 0 to 30, 60, 100, 160, 200, and 300 psi, with accuracy of ±3-2-3% of span. Gauges are available in 2” polypropylene cases with 1/8-27 or 1/4-18 NPT center-back or lower mount connections. U.S. Gauge P-575 utility gauges provide economical, reliable service in a wide range of applications including pumps, compressors, and other equipment. 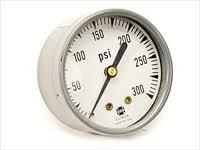 Series P-575 utility gauges come in ranges of: 0-30, 60, 100, 160, 200, and 300 psi with accuracy of ±3-2-3% full scale. Gauges are available in 1-1/2" and 2" ABS cases with 1/8-27 or 1/4-18 NPT center-back or lower mount connections (1/8 only on 1-1/2" gauges). petrochemical, and industrial plant atmospheres. However, these gauges are suitable only for use on process media which are non-corrosive to brass, phosphor bronze, or beryllium copper. other equipment. Series P-915 utility gauges come in English and metric ranges with accuracy of either ±3-2-3% or ±1.6% full scale. Gauges are available in 40 mm, 50 mm, and 63 mm ABS cases with a choice of English or metric connections in center-back and lower mount configurations. can be removed, permitting in-panel pointer adjustment. Optional stainless steel bourdon tube and socket for use where the pressure medium is corrosive to copper alloys. Specially designed to conserve space, these gauges are available for panel mounting and are widely used on medical and dental equipment where panel space is limited. Available in pressure or vacuum ranges, the 1-1/2" miniature panel mount is the smallest circular gauge available for this use. A special feature, the breakaway U-clamp, permits adjustment for panel thickness up to 0.14".